A few weeks into January and we've been fairly successful in keeping on a healthy track this New Year. Yup, we're celebrating a steady record of gym-going with only a few minor moments of food-driven naughtiness. A whole nineteen days worth! We know, you're impressed. With these lofty resolutions in mind, I had asked my husband to get me the new Giada De Laurentiis cookbook for Christmas, Giada's Feel Good Food. If you aren't familiar, it's the bombshell book where adorably petite GIada lets us in on what I've suspected all along: there's no way she's eating all those delectable bowls of pasta you see her cooking on TV. My verdict on the book is that it's a pretty good read and there are a great many straightforward, light, and appetizing recipes throughout. Think California spa food gone just a bit more substantial. It even includes some nice tips on how she cares for her skin and hair as well. 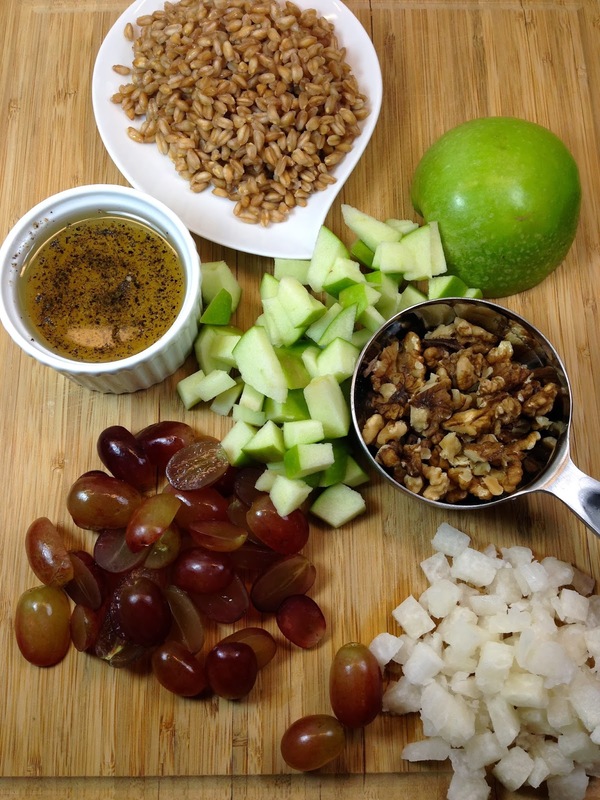 The first recipe that spoke to me was a much healthier remix of an old classic, a guilty pleasure of mine - Waldorf Salad. Could Waldorf Salad be good without the mayonnaise?, I wondered aloud. Turns out, it can. I hope you enjoy our light adaptation of Giada's recipe (we used crunchy jicama instead of fennel). We found it every bit as satisfying as the original, and filling enough to require only a small accompaniment to make an entire dinner (in our case, we added a crab cake on the side, no bun). As a lunch portion it is perfectly sized. Enjoy! 1. Combine ingredients for Dressing in a small bowl. 2. 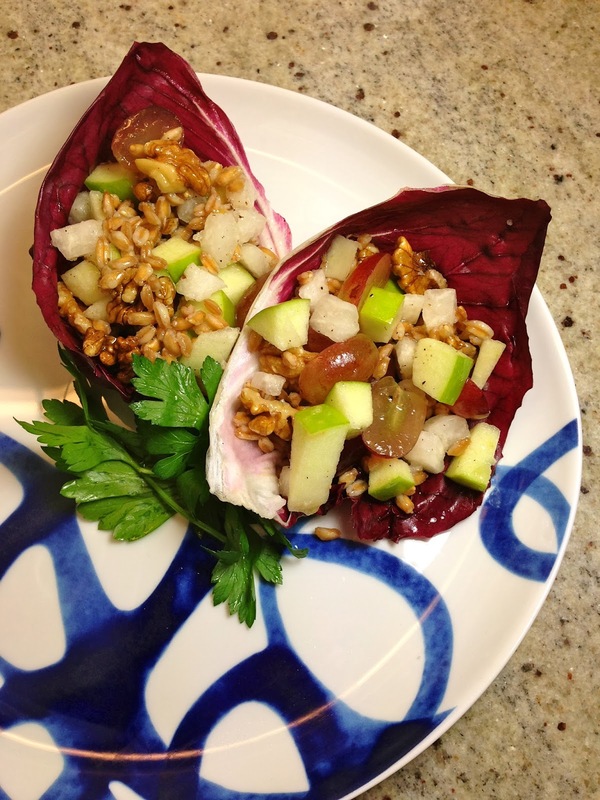 In a larger bowl, toss the Apple, Jicama, Grapes, Walnuts and Cooked Grains. Drizzle the dressing over the salad (you'll only need about 3 teaspoons), mixing gently until coated. 3. To plate, place 1 or 2 Radicchio Leaves on the plate. Spoon salad into the leaves (use both if you can't fit the whole portion, or one leaf if it's big enough to accommodate).